Merlon is a wizard from the Paper Mario series. Although he is often depicted as stubborn and comical, Merlon's integral wisdom inherently shines through, especially in Super Paper Mario. He is named after the wizard of Arthurian Legend, Merlin, as are all of his relatives (Merlee, Merlow, Merluvlee, Nolrem, etc.). 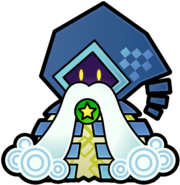 In the first three games in the Paper Mario series, Merlon's mustache is longer than in the previous one, but while his overall appearance changes, the clasp of his cloak always resembled a Star Point. According to Wonky in Paper Mario: The Thousand-Year Door, Merlon's tribe would name people based on their job, and if multiple people had the same job then they would be given the same name, implying that the Merlons that appear in the Paper Mario series are separate individuals. Merlon uses magic to expose the Koopa Bros.
Merlon is first introduced as a character in Paper Mario, acting as a major ally in-game. Here, his house has a spinning roof and is located in front of the gates to Princess Peach's Castle, in Toad Town. Mario first needs Merlon's help when a gang of black Toads block the way to the Koopa Bros. Fortress. In order to get rid of them, Mario has to talk to Merlon, then guide the wizard to the Toads (who are actually The Koopa Bros. in disguise); Merlon promptly uses his magic to blow away their disguises, sending the Koopas scurrying back to their own castle. Later in the game, Merlon is standing outside of his house. If Mario speaks to him, he tells Mario of an oracle that spoke to Merlon in his sleep and told him to walk around a red palm tree. Later, when Mario enters his house after Chapter 6, he and a Ninji request for Mario to visit Merle in Starborn Valley, who has important things to tell Mario. Merlon tells Mario to go to Shiver City first via Toad Town Tunnels. For 5 coins, Merlon can predict Mario's next path. He uses a crystal ball to do so. There is a Letter for him on Mt. Rugged. When Mario delivers it to him with Parakarry, he rewards Mario with a Star Piece. There is a Quick Change Badge in his house. Mario can get it by doing three Spin Jumps or Tornado Jumps. Then it will fall from the ceiling. Merlon often states that he is not at home. At the beginning of Chapter 1 he is actually lying (because he is later seen in). But at the end of the game, this is truth, as he is seen in Princess Peach's Castle attending the party. Merlon rambles on about a story, putting Mario to sleep, and then asks if Mario was paying attention as he snaps back awake. Madam Merlar does the same thing to Mario at Crystal Palace. He's a stubborn and mysterious old man. His name is Merlon. He uses magical powers to look into the future. I've listened to his stories before and they're really long. I try to pay attention but... sometimes I fall asleep. Still, his fortune-telling is supposedly right on. I don't know personally, but Goompa told me. In Paper Mario: The Thousand-Year Door, Merlon is the neighbor of Professor Frankly in Rogueport. For three Shine Sprites, Merlon can upgrade one of Mario's partners. If Mario gives Merlon the Up Arrow, Mario's partners can be Ultra Ranked. That's Merlon. He's this odd old man who says really bizarre things sometimes. He helps power up your allies here. For three Shine Sprites, he raises a partner one rank. Merlon appears again in Super Paper Mario, living in the town of Flipside; like most residents of this town, Merlon has a rather angular, disjointed appearance. In this game, Merlon has a larger role in this game than in the previous installments. He tells Mario the prophecy of the Light Prognosticus and provides the first Pure Heart of the game. He has a distant cousin living in Flopside called Nolrem. He also gets a quick mention when Tippi is tattling Bestovius. According to Garson, Merlon once fell in love with Saffron, the owner of Sweet Smiles. He went to her restaurant each day and wooed her constantly. Saffron agreed she would date him if he was able to finish her Saffron Special Galactic Meal, one of the most filling dishes ever made; it was said that Merlon finished all but a bit of parsley left on the plate when he received word that a poor, injured girl had mysteriously appeared in Flipside. Saffron suspended the challenge for Merlon to go help her, and he became engrossed in his studies ever since, never having the chance to return to complete it. As well as wooing Saffron, Merlon spent some of his free time at the Flipside Arcade, where he has a high score of 400000 in Forget Me Not. Merlon was responsible for saving Tippi's life when she apparently wandered into Flipside by turning her into a Pixl. He is able to revive her after she falls unconscious following Chapter 4 and makes it clear that he cares a great deal for her and her well-being, as he requests that Mario and his friends be sure to take care of her and reminds Tippi to return to him in one piece prior to her trip to Castle Bleck. Following the defeat of the final boss and the restoration of all worlds, Merlon questions Peach as to whether Tippi is happy where she is now, and Peach responds by assuring him she is. If the player visits Merlon's house after purchasing Tiptron, he will initially mistake her for Tippi before dishearteningly realizing she is only one of Francis's creations. After recounting the love many felt for Tippi, he will request that Mario and Co. take good care of her replica. Merlon's Catch Card can be found on the first floor of the Flipside Outskirts, at the bottom of a hidden hole. Humorously, if Mario refuses the first Pure Heart three times when Merlon offers it to him at the beginning of the game, he will receive a Game Over before the player is even given control of Mario. Card Description: This wizened old sage is a descendant of the Ancients. He helps Mario to decode the Light Prognosticus. You must journey to Koopa Bros. Fortress. You can travel there by following Pleasant Path to the east of town. The path begins right next to Toad's house. If you have any problems getting started, please don't hesitate to ask for my help. I can see you stuck on the way to Koopa Village. You try to continue, but there is no bridge. A tree grows near where the path ends. You smash this tree. Something drops to aid you. I can see Koopas in trouble. These must be the Koopas in Koopa Village. You are kind, and you help them with their troubles. One of the Koopas you help tells you the location of the house where the Koopa with the blue shell lives. Only that blue-shelled Koopa can help you overcome the difficulties that lie in wait on the road ahead. The four Koopa brothers are holding a Star Spirit hostage. They lurk in the stone fortress at the end of Pleasant Path, to the east of Toad Town. It is a long journey east, even from Koopa Village, and the road is full of enemies. The stone fortress is locked, and it's guarded by Koopas. You wander its depths, hunting for a key. A pink tomboy with an explosive personality is locked in the basement jail there. You help her escape. She ends up helping you, too. The noble Star Spirit is imprisoned on the top floor of the stone fortress. Your blue-shelled Koopa and explosive Bob-omb are the keys to cutting the Koopa brothers down to size. You move with haste now. The Star Spirit has many important things to tell you. You go to the south of Toad Town and find a station that is the departure point to a far-off land. The red train at the station cannot leave. Somehow, you destroy the obstacle blocking the track. You reach a mountain by train but the crevasses there are too difficult to cross. A winged Koopa is fussing about, waiting for help on the steep, stony mountainside. You help him out and earn some help yourself. I can see you climbing over a mountain in search of a desert. Braving great dangers, you cross the mountain and descend to the mouth of an ocean of sand. Your true goal lies hidden within. At the end of the path in the desert, there is a dusty town where travelers rest. It is there where you will find some answers you seek. When you leave the desert path, you are quickly swallowed up by the trackless desert. For now, you stick to the path and end up in the town. I can see you handing something to a strange Nomadimouse that resides in a desert town. The Nomadimouse waits in the back of the desert town, hiding its face with a cloth. To find that which you seek, you give up something you have already found. (If Mario doesn't give Moustafa a Lemon) The strange Nomadimouse I spoke of...he does not tell you what you want to know, even though you've given him gifts? Well, perhaps you have not given him what he desires. You go south as soon as you leave the desert town and soon you find a lush oasis. A fruit ripening on the tree is what you seek. You find it and give it to the Nomadimouse. For this treat, he breaks his code of silence and gives you the clue you need. Beyond this, I can see nothing. The one who knows the mystery of the desert hides on top of an old building. A strange Nomadimouse at the far end of town once waited by a door. You check this door. From there, you climb upward. On the rooftops, you meet the mysterious leader of the desert. You find him over to the left from where you climb up. I can see you putting a bright, flashing stone on a small rock after wandering around the desert. Hmm... Mmmmmmmmm...! I cannot see exactly where it is, but the flashing stone is pulsing rapidly and there is just one rock in the area. Wait...something else... It is on the opposite side of the desert from the oasis. I can see you entering the ruins that used to be buried deep in the desert sand. There are many surprises inside the old buildings. First you find a way to strengthen yourself, and then you find three precious stones. Deep inside, you set the stones in the correct places on statues. This is the correct way: the Pyramid on the left, the Diamond in the middle and the Lunar on the right. You go down the new stairs that appear in the deepest depths of the ruins. You descend further, drawn by the imprisoned Star Spirit imprisoned below you. A Koopa wrecks the ruins, trying to destroy you. You fight off this magic-wielding menace and save the Star Spirit. Deep inside a strange forest, someone waits in the darkness for you to arrive. He floats through the air, appearing and disappearing. He shows you the way. In the dangerous gloom of Forever Forest, I can see you talking with a creature who lives there. You turn your back to the moving bush and go into the depths of the forest. You find him waiting. In the shadowy Forever Forest, you must take the right path to get out. One path always looks different from the others, and that path is the one you always take. You look carefully at the scenery to find your way. A wise member of your party may well give you an important hint. When you escape Forever Forest, you find a spooky mansion hidden in the trees. Someone who is waiting for your help appears in front of the mansion. Inside, you gather some important information. You enter without fear. I can see you wandering in Boo's mansion, trying to find the way to get upstairs. At every turn, Boos play tricks and set puzzles. You wisely solve them all. Now...I can see you standing with a record in your hand in front of a phonograph. You distract a Boo by playing the record then quickly open the treasure chest. You climb onto the sofa on the first floor of Boo's mansion. You launch into the air and pull down the chandelier, which moves a glass case. In order to enter the door hidden by the glass case, you hang a heavy weight from the chandelier. Somewhere beyond the door, a powerful item awaits. In Boo's Mansion in Forever Forest, I can see a staircase leading downstairs. You go down to the storeroom and through several doors. In a back room, you challenge Boos for a new pair of Boots. You Spin Jump on the boarded floor and break through, finding a new path. You return a Boo to his empty picture frame, and he helps you go upstairs. When you enter the room upstairs, you find a pair of Boos waiting for you. They tell you many things. You realize that not all Boos are troublemakers. There's only one thing that has the power to scare Boos. I speak of a castle-dwelling monster that can never be hurt. There are many stories about this immortal creature. The Boos living on the windy hill have heard them all. You listen carefully to these tales then bravely head for the castle on the hill. Although you enter the castle on the windy hill, you are stopped by a locked door. You begin your search for the door key. In a room containing a large table, you open a small door and see stairs going down. Once you descend, you notice a boarded piece of floor that you can break. Down in the basement, you find the key that you seek. In the castle on the windy hill, a much-needed key waits in the room with the spiked floor. With your Boo companion, you run out onto the floor when the spikes retract. Before the spikes return, the lady Boo helps you to turn invisible. While invisible, you are not hurt. The key you find inside the treasure chest helps you continue your quest. In the castle on the windy hill, you find a room off the main corridor on the top floor. The key to the locked door is at the end of this room. You sneak through the room without waking any guards and claim the key. You unlock the door and step into the heart of the mystery. I can see you running away as fast as you can. You open the treasure chest next to the bed where the immortal monster is taking an afternoon nap. You find a magic talking key inside the chest. This key unlocks a tower with a turning windmill. The immortal monster keeps a secret deep below it. You run there as fast as you can and teach him a lesson once you learn his secret. I can see a Star Spirit that can't return to where it is supposed to be. Help it find its way back to Star Haven and then come back to Toad Town. I can see mischievous folks playing tricks and bothering the citizens of Toad Town. You walk west from the southern shop and see these small people entering and leaving the second house from the shop. They don't enter the house if they see someone inside because they're cowards. You turn invisible to trick them. You go into the house second from the shop in the south of Toad Town, and find a hidden door that leads to a Toy Box. The mischievous thieves and all of their stolen goods are inside the box. You leap in after them. Inside the Toy Box, you use jack-in-the-boxes to move on. The jack-in-the-boxes with stars on their sides make you go higher and farther. They help you out mightily. You find a key and return to Toad Town. The owner of the shop in the south of Toad Town is sick with worry about a stolen key. You return it to him. He offers you a reward, so you take something that you noticed was missing inside the Toy Box. You get a train, but you don't carry it into the Toy Box. Instead, you put it in the box from outside. The train is a welcome addition inside the Toy Box, and now you are able to move on. Building blocks and a fence block your way in the Toy Box. You have to make good use of the jack-in-the-boxes and a revolving wall to continue. When the revolving wall turns, you slip through the opening. Only perfect timing gets you to the other side. You have tracked down a precious frying pan. You give it back to a Toad Town cook, who gives you something useful in return. You re-enter the Toy Box with your new reward. It will help you on your way. I can see you standing beside a huge Shy Guy who is too hungry to move. You give him a fabulous Cake made by a very talented cook. He finds it so delicious that he goes away. That talented cook makes the Cake again when you give her the Cake Mix. You hit a dead end on the moving walkways of the Toy Box. Instead of trying to jump over, you turn invisible and slip through the net. Soon enough you reach some blocks that move up and down but you cannot jump to your goal. You jump to a high spot near the platform and hitch a ride with a Paratroopa. An illegible memo is the key to continuing through the Toy Box. You give the dictionary back to the scholarly Toad. With it, he is able to decipher the Shy Guy's language. He tells you the answer to a puzzle. He says that you must smash the four colorful boxes in a certain order to open the way. If you remember the clue, you'll know the right order. The path you choose might be completely dark. When you can't see a thing, it's a good idea to take a different path. When you enter another dark room, something carrying a light appears. You defeat this scary creature and make a new friend. You find the light that gleams in darkness and discover a glittering child in a lantern. The way ahead is often dark, and you cannot go forward without light. You save the sparkling child imprisoned in the lantern. When you break the lantern, the child is freed. This bright child often lights up what is hidden. When you bring light to darkness, Shy Guys flee from it. They are running toward the thing that you seek. You follow them with the light. A difficult test awaits you. The Star Spirit can only hope for your victory. There is a strange island floating by the port docks. You jump on it and smash down to get a rise out of it. Soon after, I can see you with a light amid warm darkness. ...You do know where the port is, don't you? I suppose I'll tell you, just in case. Go straight in the direction opposite Forever Forest. A journey to a faraway island is your destiny. I can see you crossing the sea with one who is indebted to you. I can also see a Star Spirit waiting for you in the heart of a volcano. On the jungle island to the south, I can see an erupting mountain. You must find a path to this volcano. Ohhh...! I can see Yoshis. Many Yoshis. The Yoshis know something, so you talk to them to learn the answers you seek. The baby Yoshis are at a mischievous age, and they play hide-and-seek on the jungle islands. You help the fish baby-sitter when she loses them and asks for help then you are helped, as well. The Yoshis' hiding places seem impossible to reach. You find them all by moving bushes out of your way, crossing the water, and hitting the tree stumps. Underground...on top of a tree... behind a bush...on a distant island...deep in the jungle... ...that's where all the baby Yoshis are hiding. I can see you looking puzzled in front of a big stone statue in the depths of the jungle. You talk to the chief of the village, who is pleased to have the children back safely. As a reward for finding them, he gives you something beautiful, which is the key to your continuing quest. You put what you received on the big stone statue in the depths of the jungle, then you follow the path that appears. In the deep, dark jungle, you shake the bushes, plug the geysers, and pull the vines to move ever deeper. You reach the base of a gigantic tree. You see a black shadow perched atop this huge tree. It watches over the jungle... and it is glad to help you. The giant jungle guardian helps you by building a bridge. You cross it. Your destination is the erupting volcano. Somebody is waiting for your help in the depths of its superheated caves. You ride across the molten lava to enter the bubbling depths. A flood of magma is blocking your way. It's too wide to cross. You climb to a nearby platform and use blue blocks to slow down the flow of lava. A powerful item awaits you on the other side. Deep below the earth, you hammer a line of blocks to dust. A spiked boulder opens a path. You go deeper and sense that a Star Spirit cries out just ahead of you. A massive fire flower stands in your way. Water beats fire, you know. A treasure chest blows clear from a violent eruption. It lands deep in the jungle. It waits for you. The chest has fallen to earth near the spot where you met your aquatic companion. A treasure-hunting Koopa in Yoshi's Village finds a magical seed. Why is that important? The seed is vital to your quest! You hand over your new-found treasure and get this seed. There is a lot of empty space in the Toad Town flower garden. A door opens when enough flowers bloom. You need seeds. You find the special seeds in Toad Town, Forever Forest, Jade Jungle and on Mt. Rugged. Once you find seeds from four different colored flowers, you take them to a girl who tends the Toad Town flowers. You need all four seeds. I can see a Star Spirit waiting for you in the cloudy sky of a different world. This world lies just through the door. You search for a Magical Bean that grows a vine into the sky. To the east of the big tree, I can see a flower being pestered by creatures who dwell under the ground. The annoyed flower really loves seeds. You help her out. Your reward is the precious Magical Bean. In order to grow the Magical Bean in Flower Fields, you first search for Fertile Soil. You give a starving red flower a Red Berry. This tasty berry falls into your hands when you smash the tree near Petunia. The red flower lets you through its gate and you continue on your way. Soon enough, you meet another flower. This flower is only too happy to give you Fertile Soil. I can see you talking with a flower at the bottom of the dry spring in Flower Fields. The waterless spring is beyond the gate that the yellow flower stands guard over. You give the yellow flower a Yellow Berry, and it repays you by opening the gate. By smashing the tree beyond the red flower's gate, you find the Yellow Berry you need. The precious stone that the flower of the spring seeks is in the garden beyond a confusing hedge maze. The keeper of this garden has many thorns but is very beautiful. You hang on every word she says. A sparkling berry from a crystal tree is the only treasure beautiful enough to match the Water Stone. You talk to Posie and she gives you what you need. You take the sparkling berry to the rose in the flower garden. She finds it irresistible and trades the Water Stone for it. When you put the stone in the dry spring, water begins to flow like magic. I can see you trying to clear the air of clouds. You search in vain for the sun, hurrying beneath dark clouds. The sun, trapped by the menacing sky, cannot rise. He tells you important news. A cloud rider stops you as you travel from your visit with the sun. He will join you. With his aid, you stomp on the colored blocks in the correct order: green, purple, red, green, green, purple. When you find the cloud-making machine, you smash it to bits and bring the bright sky back. I see you planting a magical vine that you hope will grow higher and higher until it pierces the clouds. When planting it, you do everything in the right order. First, you prepare the soil. Next, you plant the seed. Finally, you give it water. Only the right order will do. The Star Spirit is being held in the clouds. You climb your magic beanstalk up and up. The Star Spirit is waiting for you on a cloud in the sky. You battle a giant cloud monster, destroying the smaller clouds as they appear. The greatest danger comes from powerful bolts of lightning. You travel to a far-off land, a frigid place covered with snow and ice. You find new strength in the deepest place under Toad Town. Using your new ability, you are able to enter a new path. A blue door on a high ledge beckons, but you can't reach it. There are several things invisible to the naked eye near the door. With the help of your sparkling companion, you see the way. I can see you visiting the most important penguin in a cold city. You travel on the snowy path to the west of Shiver City. A glittering town lies in the frosty valley. It is here that you learn some vital information and receive a gift to help you on your way. The cities in the frozen land have been friends since times long past, and each holds an ancestral treasure. You already hold one treasure, and you receive the other from the most powerful penguin in the city. I can see some snowmen in a row in front of a cliff. You add decorations to them until they all look the same. The way to the frozen heights opens soon after. You climb up a steep mountain and break the cracked wall beyond the stairs. You enter an icy cave. The room is filled with crystal pillars, and your eyes deceive you. You think for a moment that it's a dead end. You don't trust your eyes. You keep moving forward. You find something helpful once you break the illusion. Someone needs your help in the Crystal Palace that perches atop the mountain. You have received a gift. You use it as a key and climb to the mountain's top. Once you've scaled the frozen heights you spot the palace you need to reach. You think that you're looking at your reflection in a mirror, but no! Something mischievous is imitating you. You enter the blue door and walk through the columns to reach the other side of the glass. In the Crystal Palace, often what you do on one side of the glass affects what happens on the other side. You break a boarded piece of floor in the back, then go back to a room in the front. Where there once was a red X, there is now a hole. You enter the red door and beat the guards on the bridge. Their statues disappear. You place your explosive friend by a red switch and go through a revolving door. You find a large stone statue in a room. It doesn't budge even when you push it. Your Koopa friend helps you hit a switch in the reflection. You cross the bridge and make your way around to its twin. Eventually you find a smaller stone statue and push it aside. You discover that the large statue has moved as well. I see creatures that change direction when you talk to them. I also see identical stone statues that you can move by pushing them from the rear. By talking to the creatures, you get them to face the right directions. You then push them to cover the pads on the floor. Once you solve the puzzle, stairs appear that lead to the door high up on the wall. You continue into the palace. A frozen king rules in the palace on the snowy mountain. He seems to split into three kings, but two of them are phantoms. To be sure, you attack all of them at once. The last Star Spirit is freed once you defeat him. I can see the Star Spirits gathering and waiting on Shooting Star Summit. They are waiting for you, of course. You need only to walk up there and a route to the sky will be made clear. The power of the Star Spirits and the strength of your wishes lead you to the castle. The root of all this evil misfortune awaits in the floating castle in the sky. You must fly there. The way up leads from Star Haven. I can see a long corridor of flowing lava. A speaking statue makes your journey more difficult, but you survive with your friends' help. After cooling the lava flow, you continue your journey to the top of the castle. Your quest's end awaits you on high. I can see two rooms with high ceilings. When you pull chains in these rooms, water flows. You use these to continue. After climbing higher and higher, you come to a room that seems to be a dead end. You move a stony face of Bowser to find the entrance. In the first room, you push the Bowser on the right. In the second room, you push the Bowser on the left. In the third room, the Bowser in the middle is already open, but it is a fake. You push it to the right. The path opens for you. Either your Koopa friend or your explosive companion helps you when you find a red switch. A repeating series of high and low paths confuses you. The blue torches behind the wire fence give you a clue. You go forward in the same order as the torches: up, down, down, up, down, up. The princess is just beyond this final puzzle. I can see you fighting with the evil king on the highest ramparts of the castle. The Power of the Star Spirits helps you in your fight. You never give in, even when the battle looks dire. The small star and the princess give you all the help they can. Do not delay, Mario... You must win the final battle... ...to return hope to the world! Deāru From dearu, the verb "to be". Mòlóng From the English name. In Super Paper Mario, Merlon plays a similar role to Professor Frankly from Paper Mario: The Thousand Year Door, as they are both wise old men who aid Mario in his adventure and bear some relation to his Tattle partner. This page was last edited on March 5, 2019, at 08:02.